Each teacher needs to have a personal philosophy of teaching to guide his/her actions and ideas. This is one I have made to guide myself. It is by no means all-encompassing, but it provides a basis for what I feel about education, and what I want my students to feel when they leave my classroom. Learning is, of course, the main purpose of education. It is the goal of every student and the task of every teacher to increase knowledge and understanding in the classroom. I certainly want my students to learn the fundamental content of the courses I teach, but beyond that, I hope to foster critical thinking, facilitate the acquisition of life-long learning skills, and prepare students to function effectively in an information economy, and develop problem-solving strategies. I feel that the concept of learning should be focused around four main areas. Independent thought is essential to the development of each student. Being able to form unique independent ideas to solve problems will serve them both in and outside of the classroom. Group interaction is also an important part of learning. Being able to share ideas, validate them with those of others, and teamwork are important processes in social and mental development. I would like also to lead my students in the direction they should go to reach correct conclusions and answers, without always providing the answers themselves. Finally, I would like to stress the use of learned ideas and processes in new situations. By using information, students should be able to apply what they have learned to new life or learning situations. Transfer of this sort is what really determines what has been learned. In order to aid students in reaching their desired learning goals, the teacher must have a clear set of objectives. Here are mine. As a teacher I like to serve a number of purposes. First and foremost, I like to act as guide, pointing students in the direction they should go to find answers and solve problems by providing them with the essential information they need to do so. I believe that a teacher is someone who is passionate about a topic and equally passionate about communicating that topic to others. Effective teaching involves not only being passionate about a subject, but also being able to convey it to students in such a way that they will understand it, but additionally, be able to then think about the subject and apply it in some way to their lives. I love also to act as advisor or facilitator. This is essential, especially in the university setting. Students at this level need input and more assistance in deciding on courses to best reach their personal academic and career goals. I like to serve them as an instructor to help students in making important decisions in these areas. Students also need to feel comfortable approaching their instructor for discussion outside of class. I want to act as their mentor and friend, to help students to make professional contacts, find professors to aid in career plans and use for recommendations, and have an academic source to call upon when stresses of classes begin to be overwhelming. I believe in being fair as a teacher, which to me means being able to understand what students are going through as individuals and as students. It means treating students with an impartial, but not an uncaring attitude. I would like to see my students more often than just in the classroom. As an instructor, I am interested in making education as enjoyable and beneficial as possible for students. By acting in all of these manners, I would like to make student's education to be more complete and enjoyable. As a teacher, I want also to set specific goals for students. Mastery of information has always been the goal for teachers, and should continue to be one of the essentials. I like to set long term goals for my students to allow them to work towards these goals over time. As a part of this, I think that intellectual development of each student should continue over time, allowing students to use what they are learning later in life. It is also my hope as a teacher that my students will develop an interest in the subject area being taught. Although I am aware that this does not occur in all cases, I think that students should at the very least develop an appreciation for the subject and the material being taught in the classroom. This leads to an expected question: how does one implement this philosophy? As with anyone involved in education, student or teacher, a personal growth plan should always be included. One never develops socially, intellectually, or academically, without consistently learning new things and striving to further oneself. This requires constant self-development/self-improvement by creating ideas for day-to-day use. This can include classes as a part of a continuing education program and receiving regular input from students. Finally, by continually asking myself, "How do I conduct my classes?" to examine how close I am sticking to my educational goals. I think that teaching should challenge both the teacher and the student. Students should be challenged by the teacher and the course materials. Teachers should be challenged to try to deliver course materials in different ways and from different perspectives. I consistently attempt to improve my teaching style and try new ideas or strategies on regular basis. In addition to student advising, I also enjoy teaching lecture-style courses, for example: General Chemistry, Quantitative Analysis and Instrumental Analysis. In the future, I would be happy also to teach subjects that are related to my research. For example, I would like to design my own novel, advanced course to convey the state of what is currently known in the area of sensors, electrochemistry, alternative sources of energy and nanotechnology. By reading and discussion of selected literature, I would like to point out novel scientific interests and achievements in this area and help students to become familiar with them. Currently I teach Independent Studies courses, where teach the above described topics to the individual students that are interested to broaden their knowledge horizons. This U.S.-Polish International Research Experience for Students (IRES) project creates a unique three-year opportunity for U.S. students at Adelphi University to acquire early career research experience abroad in the fields of materials science and nanotechnology working side by side with renowned European scientists. Through this collaborative project between Adelphi University and Warsaw University, IRES students will participate in research focused on development and characterization of novel composite materials for alternative energy sources and environmental remediation applications. The photoelectrochemical and photocatalytic properties of the new materials will be thoroughly characterized using state-of-the-art instrumentation to correlate the structure and properties of individual components with properties enhancement of the nanohybrid composites. The US-Polish team expects to gain a better understanding of the basic working principles of these semiconducting nanohybrid materials in order to increase their effectiveness in photocatalytic and photovoltaic devices. The IRES project supports the participation of four U.S. students annually, twelve total for the three-year duration. The US PI will recruit qualified IRES students from diverse and under-represented backgrounds. U.S. student participants will spend eight weeks at the Faculty of Chemistry, Warsaw University (UW) in Poland working together with their U.S. and Polish mentors and Polish students on thematically-linked research projects focused on photovoltaics and photocatalysis. Pre-trip training includes both technical and cultural preparation. As a prerequisite to the summer program in Poland, students take an independent study with the PI to learn about experimental methods and theoretical aspects relevant to the proposed studies. Post-travel follow-up by the PI continues with scientific mentoring and career advice. will learn to work in an interdisciplinary, multi-cultural environment. The results of this collaboration will be disseminated by presentations at conferences, publication of journal papers, as well as outreach to high school students and teachers. Overall, the cooperative activities of this IRES project are expected to enhance STEM education at both institutions, strengthen international partnering, and facilitate the development of research collaboration in this critical area of national and international need. agreements with over 300 academic partners from 60 countries, among them Adelphi University. academic institutions from all over the world through the Erasmus Mundal Programme. excellent record of scholarly activities. This is the leading organization in Poland in the area of chemistry that is also well recognized by the worldwide scientific community. Specifically our host, the Laboratory of Electrochemistry at the Faculty of Chemistry, Warsaw University has great expertise in the proposed field of synthesis and characterization of hybrid materials based on conducting polymers and inorganic semiconductor nanostructures and their application in photovoltaic cells and photocatalysis. 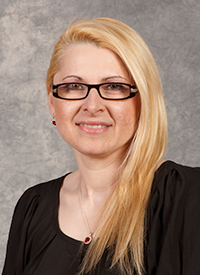 The publication records of our Foreign Mentor Prof. Magdalena Skompska speak for themselves (http://www.chem.uw.edu.pl/people/MSkompska/eng/publications1.htm). experiences for U.S. and Polish student participants. 1. Widera, J.; Riehl, B.L. ; Johnson, J.M. ; Hansen, D.C.; (2008), “State-of-the-art monitoring of fuel acidity.”. Sensors and Actuators, B: Chemical, B130, 871-881. 2. Lunsford, S. K.; Speelman, N.; Stinson, J.; Yeary, A.; Choi, H.; Widera, J.; Dionysiou, D.D. (2008), “Electroanalytical and spectroscopic studies of poly(2,2'-bithiophene)-modified platinum electrode to detect catechol in the presence of ascorbic acid.”. Journal of Chemical Education, 85, 128-129. 3. Lunsford, S.K. ; Widera, J.; Zhang, H.; (2007), “Detection of catechol by potentiometric-flow injection analysis in the presence of interferents.”. Journal of Chemical Education, 84, 1471-1473. 4. Lunsford, S.K. ; Stinson, J.; Widera, J.; (2006), “Electrochemical detection of catechol/neurotransmitter in the presence of ascorbic acid at conducting poly (2,2-bithiophene) platinum electrode.”. ECS Transactions, 3(10), 13-19. 5. Lunsford, S.K. ; Stinson, J.; Widera, J.; (2006), “Electrochemistry and Detection of Organic and Biological Molecules Such as Catechol and Ascorbic Acid at Conducting Poly(2,2-bithiophene) Electrode.”. Analytical Sciences Digital Library, Supported by the NSDL program of the National Science Foundation, ASDL e-Labware Publications, Electrochemistry and Detection of Organic and Biological Molecules, 10041. Widera, J (2008, March). “The Journey from Macro to Nanochemistry.”. Division Avenue High School, Levittown, NY. Widera, J., (2008, January). “IrOx fuel acidity sensor.”. Warsaw University, Warsaw Poland. Widera, J., (2007, November). “Iridium Oxide (IrOx) Based Fuel Acidity Sensor”. Department of Chemistry, St. Johns University. Widera, J., (2007, October). “Iridium Oxide (IrOx) Based Fuel Acidity Sensor”. Graduate Center of the City University of New York, NY Science Center Room 4102, 365 Fifth Avenue, New York, NY,. Widera, J., (2007, March). “IrOx based fuel acidity sensor.”. American Chemical Society, local Long Island Section. Widera, J., (2007, February). “IrOx based fuel acidity sensor.”. Wright State University. Widera, J., (2006, June). “Smart Careers for Girls in Science, Technology, Engineering and Math” in Mineola High School, Garden City Park, NY sponsored by Long Island Fund for Women & Girls as a part of Gender Equity in K-12 Education Community Collaboration Special Events Series,. Mineola High School. Widera J., (1969, December). Nanoasized materials for solar applications. Fall 2010 Boston ACS meeting by the ACS Inorganic Division, Dr. Stanislaus S. Wong, Nanoscience Programming Chair and Past Chair of the Nanoscience Subdivision. - Senior Honors Thesis: Hoang Long Nguyen, “Detection of sodium and potassium ions in sweat samples. Modification of sweat rate during the endurance performance.” Supervisor Dr. Widera J. - PI – Dr. Widera J., The Alchemy of Art” Art and Science Symposium and art exhibition, two donations from publishers: Norton ($1,000) and Cengage Learning ($1,000). Dr. Widera would supervise one or two UW PhD candidates for a semester or a year abroad at Adelphi, and the candidates' travel, tuition, research materials, accommodation and meals would be fully supported by the grant. - PI – Dr. Widera J., February 7, 2006 Adelphi Faculty Development Grant project title: “Development of Spectroelectrochemical Sensing Platform for Detection of Phenol Type Compounds.” ($5,000), Adelphi University. - PI – Dr. Widera J., January 2006, project title: “UV-VIS and Fluorescence Spectroscopy of Highly Luminescence CdS Nanoparticles” ($5417.17) type B grant from Ocean Optics. - PI – Dr. Widera J., January 2006, Frederick Bettelheim Research Award for junior faculty member in the Natural Sciences, project title: “Iridium oxide (IrOx) based fuel acidity sensor.” ($1200), Adelphi University, Frederick Bettelheim Family foundation. - PI – Dr. Widera J., September 1996, project title “Photochemical properties of n-GaAs/conducting polymer junctions.”, original research proposal funded by the State Committee for Scientific Research (Polish governmental agency – KBN, equivalent to NSF in USA) for Justyna Widera as a young scientist. * Natana Podlubnatya (2009). Senior Honors Thesis: “Electrochemical detection of neurotransmitters.”. Adelphi University. * Owen Jappen, student from Division Avenue High School, Levittown, NY (2009). LI –JSHS, Long Island Junior Science and Humanities Symposium “Development of Titanium Dioxide nanoparticles-based solar cells.”. Adelphi Univeristy ' Division Avenue High School, Levittown, NY. * Jack Lohne (2008). Masters thesis “Multielemental ICP-MS analysis of classical period archaeological bone and soil samples found at Demosion Sema in Athens, Greece.”. Adelphi University. - Organization of the Art and Science Symposium “Intersections of Art and Science” and Exhibition “The Alchemy of Art” at Adelphi University, October 29, 2008 (chair: Dr. Widera J., other committee members Puneeta Mittal and Richard Vaux).